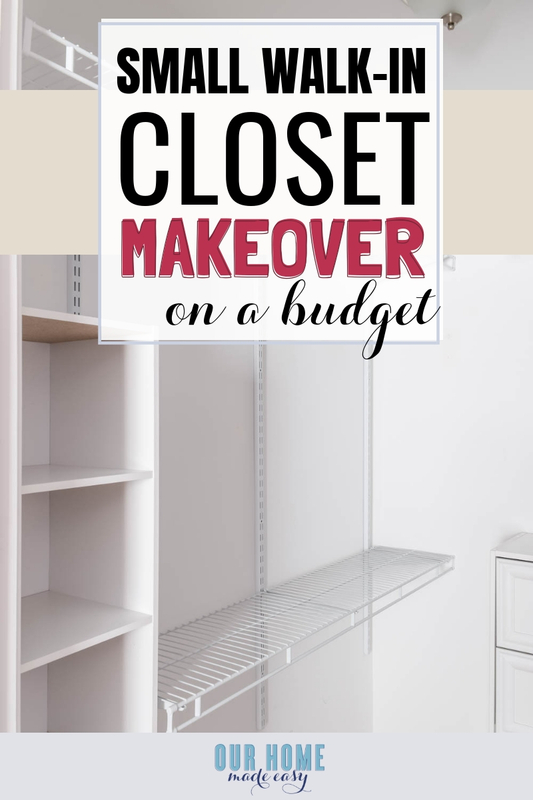 DIY small bedroom closet organization for a small budget! 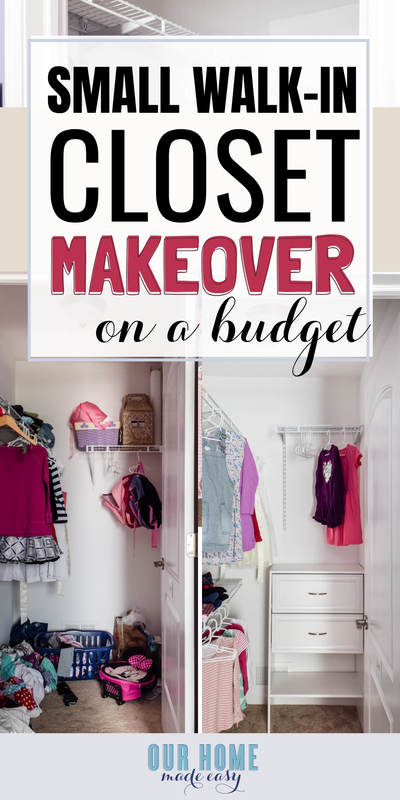 Makeover your closet in just one day save money compared to professional closet companies. 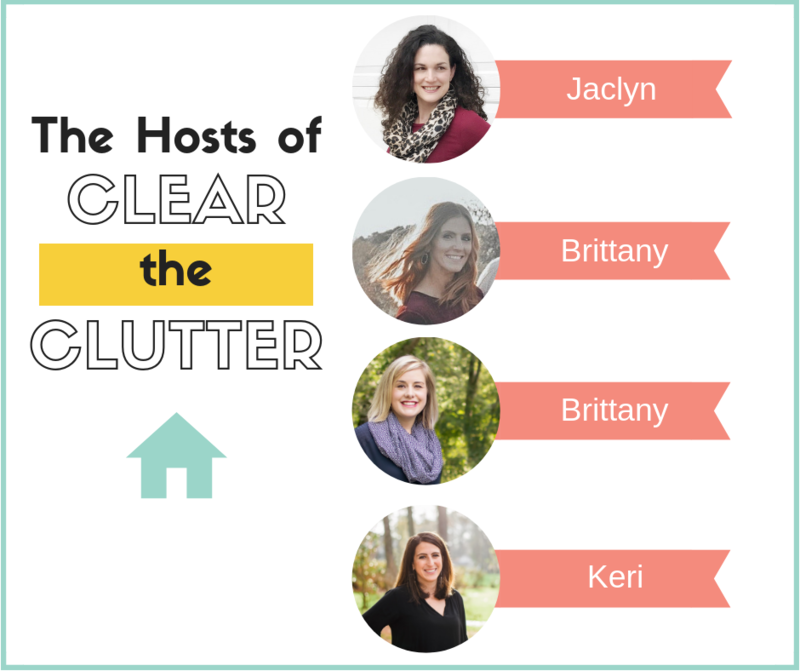 Today starts Week #4 of ‘Clear the Clutter,’ a 5 Week Organization Challenge with a few other awesome bloggers! 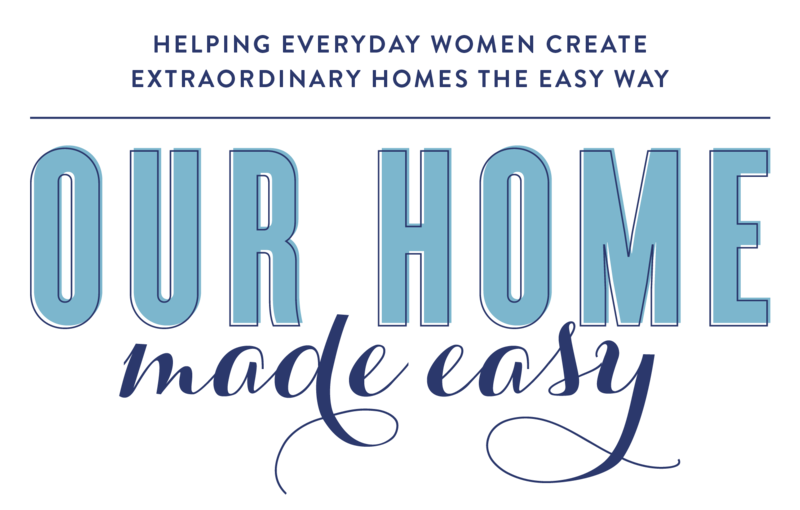 Over the next week, we will be organizing our homes with you! Last week we organized my jewelry and included several DIY jewelry organizers for anyone who needs an easy way to start organizing. 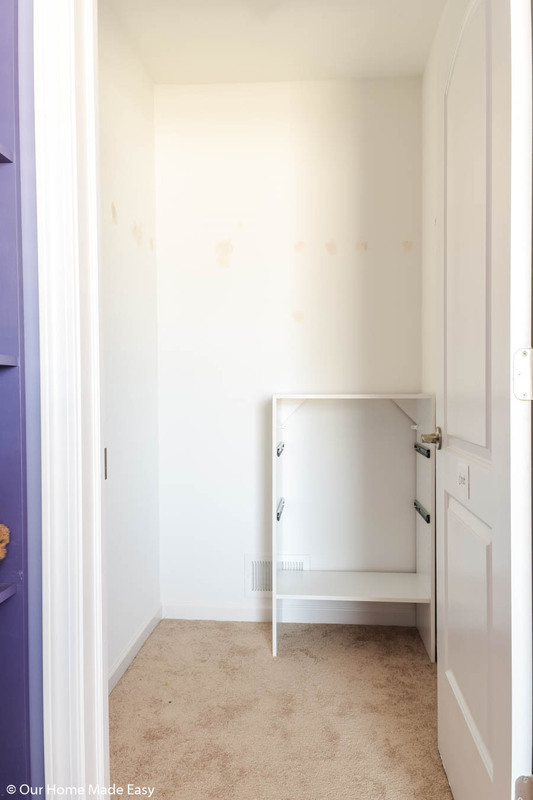 The week before, we organized our mudroom. 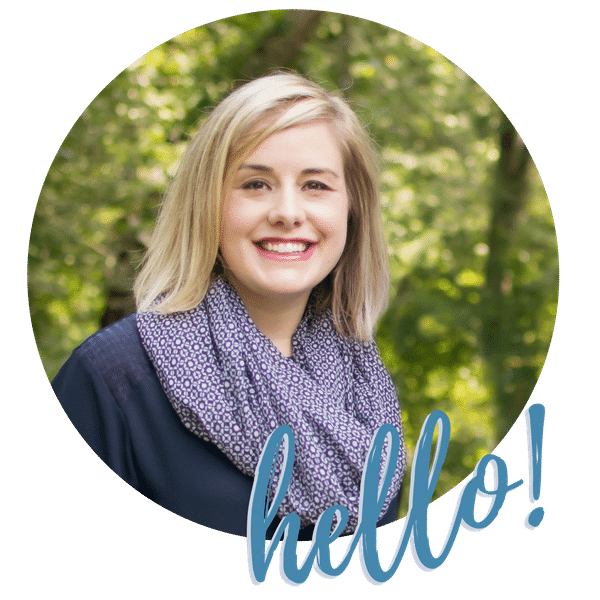 When we built our home over five years ago, we initially planned for Aubrey’s room to be the guest room since it was furthest from our room. She was only 3.5 months old when signed papers to build. 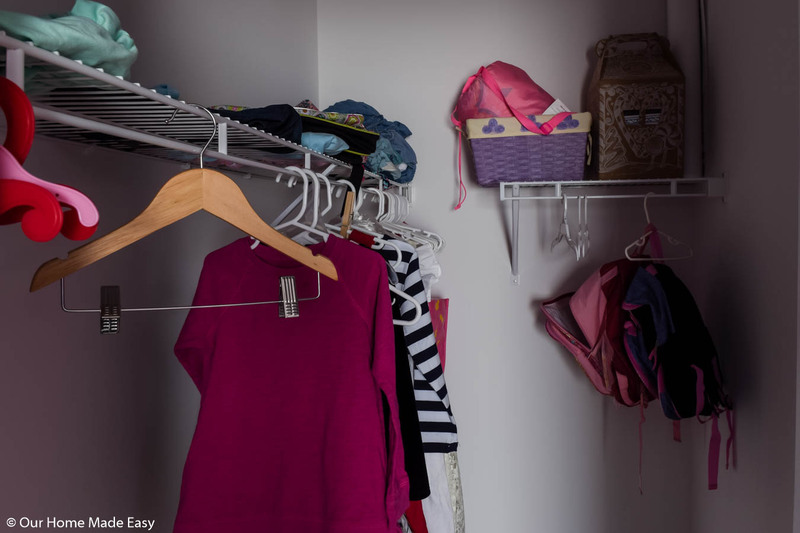 But closer to the move-in date, we I, decided that she should be in her now room since it had a walk-in closet and could help store all her baby things. And that seemed like a great plan until you actually looked into the closet. It’s 4′ wide, by 6′ deep, with a door that opens into it. It’s almost completely unusable space with that door. 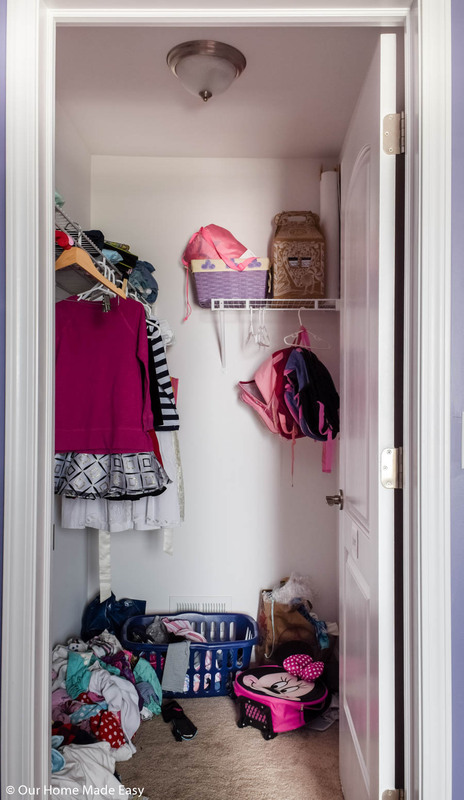 When you look into the closet, you cannot have anything that sticks out further than 12 inches from the wall, for the first 22 inches of the closet. 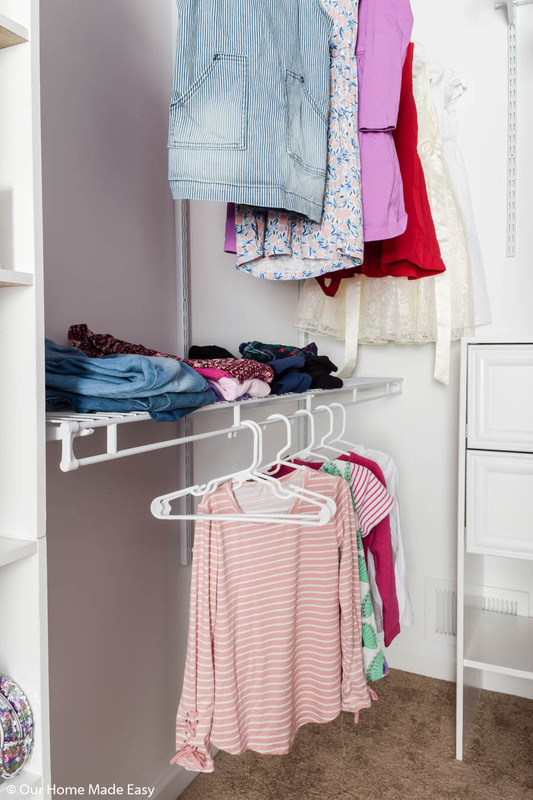 In case you were wondering, the standard hanger, shoulder to shoulder, is 22 inches wide. 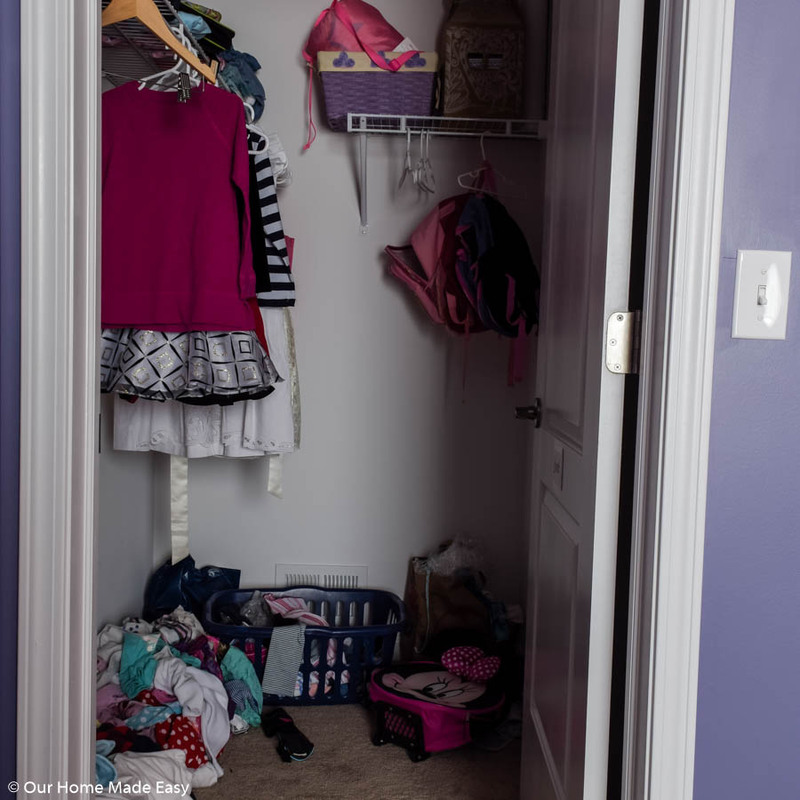 Over the past five years, we’ve kept Aubrey’s hamper, outgrown clothes, and clothes-to-be-worn in the closet. That’s it. 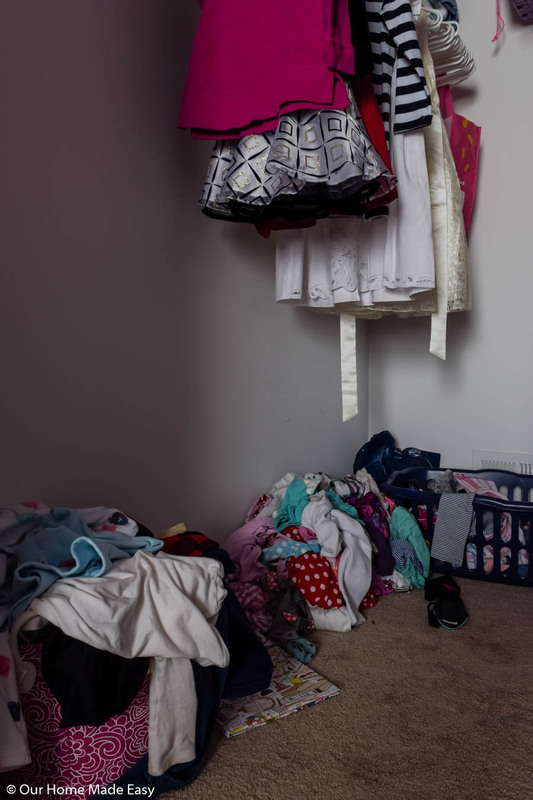 All of her clothes that she regularly wears belong in a dresser in her room. It’s been kind of a ‘close it and forget about it‘ situation. We really wanted to get her large dresser out of her room to give her more play space and FINALLY make that closet somewhat functional. Week # 4 seemed like the perfect time to take on the project! Initially, we went to The Container Store to help us design the closet. Since it’s so awkward, TCS had just one option and we didn’t love it. Or the price tag, but that’s okay. 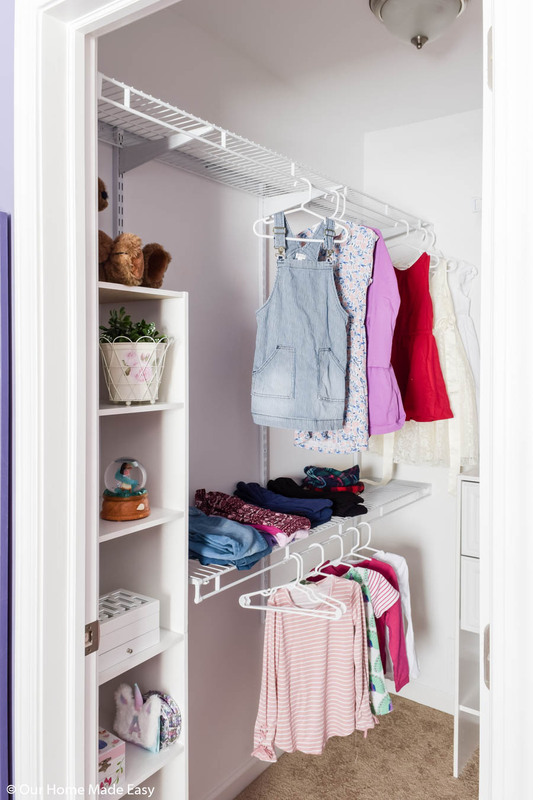 The Container Store has awesome products, but we didn’t think spending so much on a 5-year-old’s closet was the BEST use of DIY funds. And something that the store’s design didn’t offer? 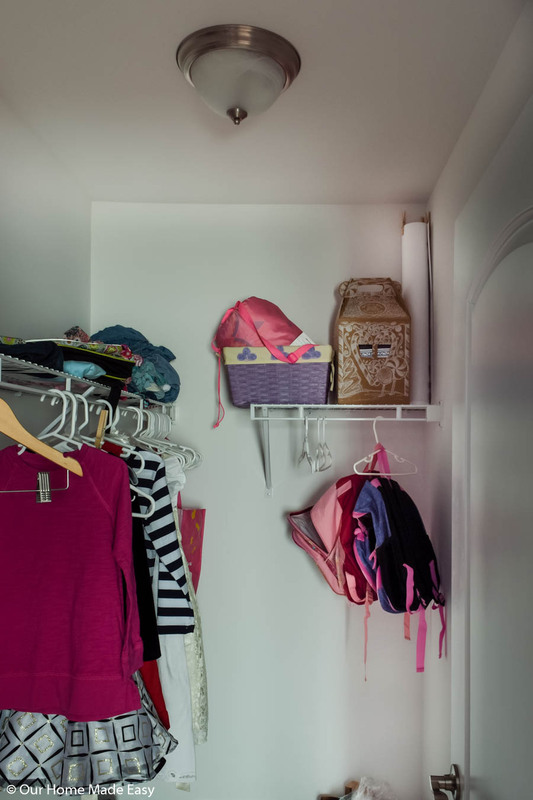 We wanted Aubrey to have a lower set hanging to help encourage her to hang up her clothes and keep them organized. They were planning the lower space for something else entirely. 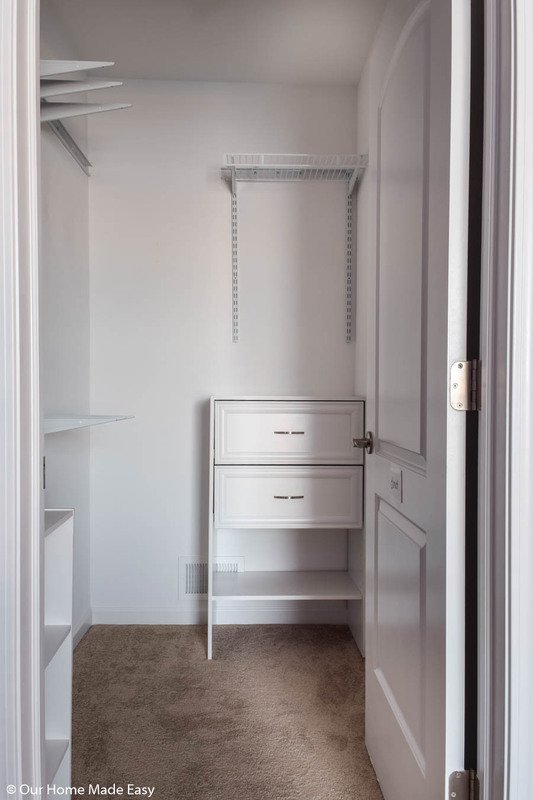 Here is the finished closet! 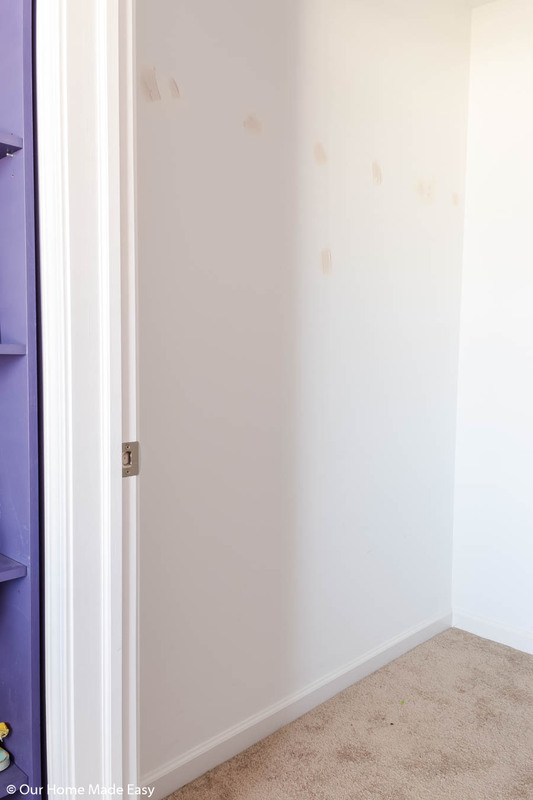 First, Jordan removed the existing shelving and hardware. Then he patched the holes and sanded them down. 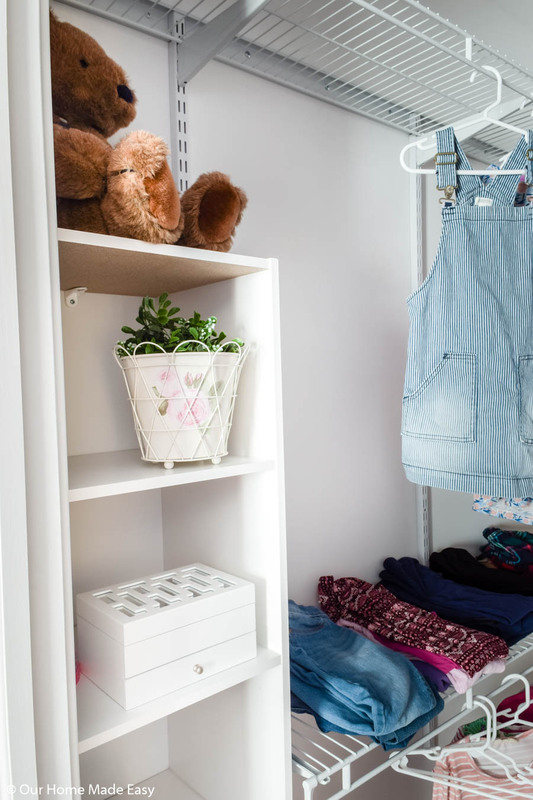 Now, Aubrey doesn’t need to have the dresser outside in her room since the drawers store everything that cannot be hung or placed on the wire shelving. Jordan built this unit and then added 2 drawers. It was about 50% of the cost of the entire project, but totally worth it. We chose adjustable wire racking to give us (and future grown-up Aubrey) some flexibility to how to arrange the shelving. 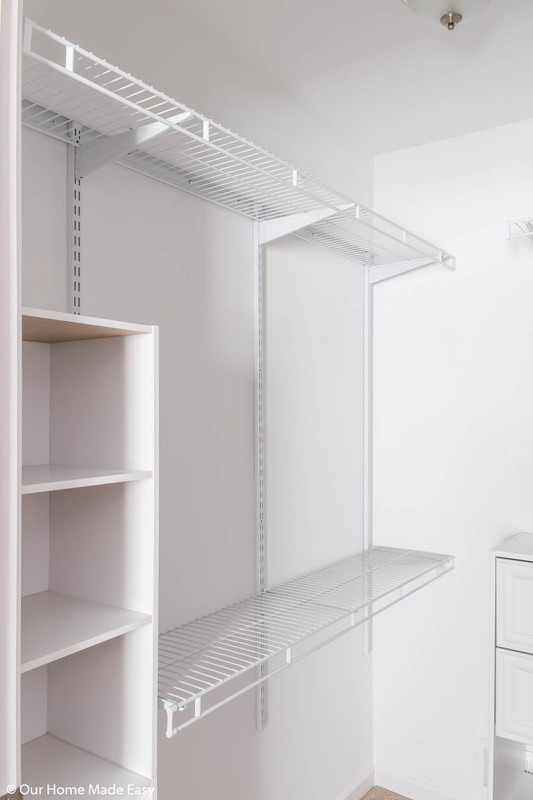 Since we did choose the adjustable racking, we were able to reuse the wire shelving already installed in the closet! That top piece and short side piece? Reused! Not only did we save some money, but it’s also exactly what we would’ve needed and was already cut for the hanging space. And it helps keep all hangers from colliding with the door. Now we know that anything hung after that section will work. We are hoping it keeps everyone a little less frustrated. Jordan used the ClosetMaid brand for the inside of the closet. We discovered that we could DIY it on our own terms, for a much more reasonable price than what The Container Store initially offered us. 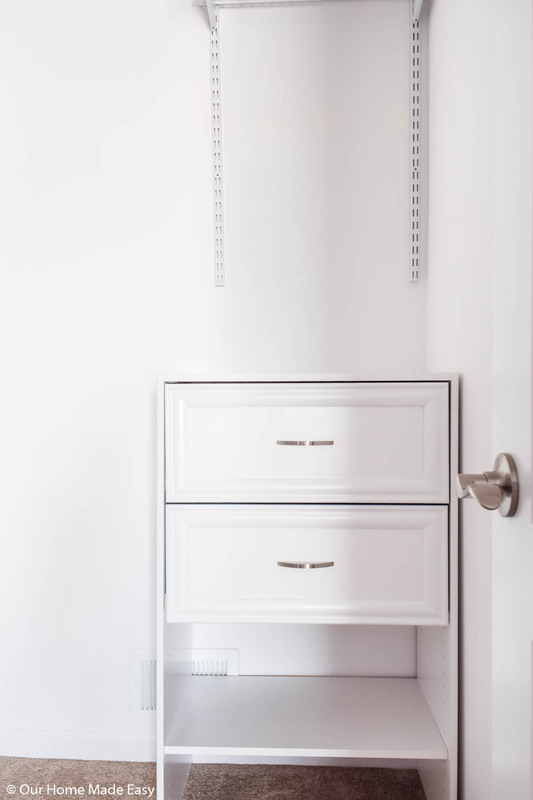 The total cost of this DIY small bedroom closet makeover was just under $300. And that is week #4 of the challenge! 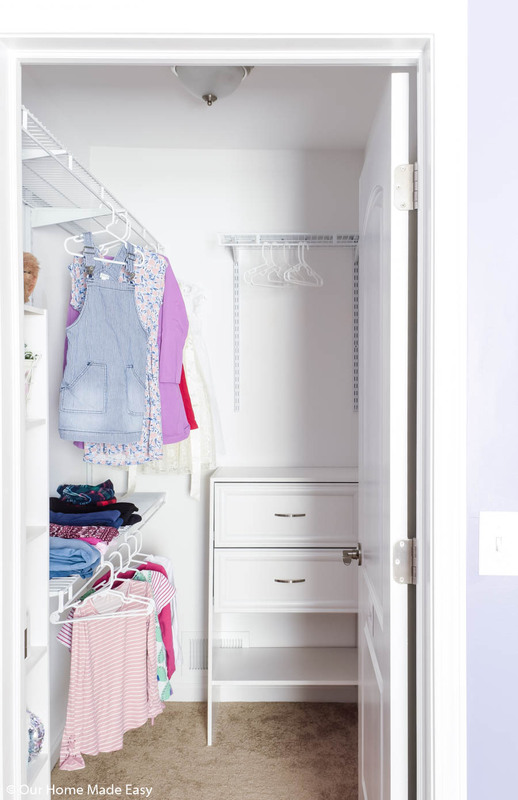 Are you ready to declutter and organize your bedroom closets? Let me know in the comments below! And don’t forget to grab your copy of the Clear the Clutter Organization Calendar! It will walk you through each room of your home over the next month. Even if we officially finish the challenge, you can follow along anytime. The closet turned out great. I’ve been busy decluttering and organizing my house lately, so I am always looking for inspiration as I do that. 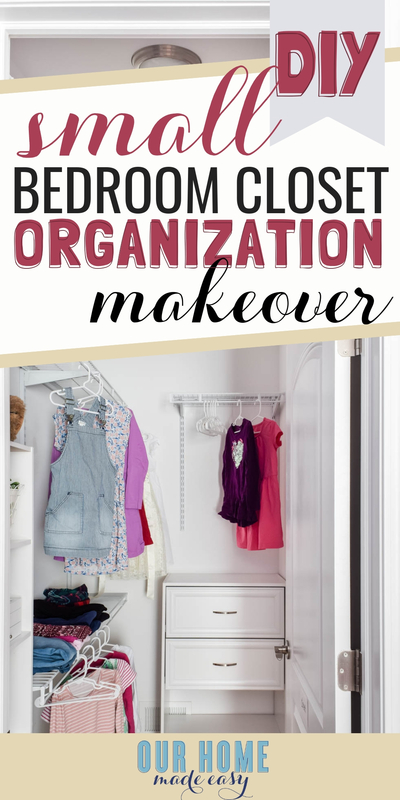 Funnily enough, we don’t have a closet in our master bedroom, so we make do with a wardrobe – which doesn’t give us a lot of flexibility with organizing. 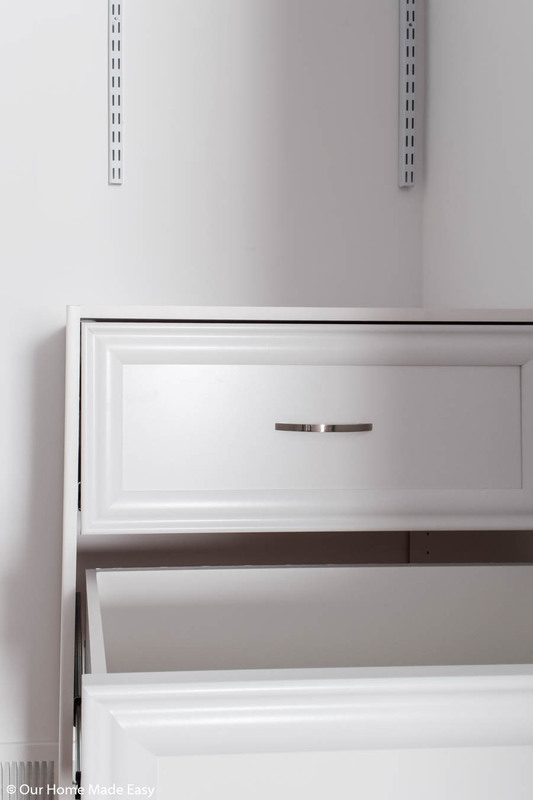 I love the idea of putting a dresser inside the closet, as that clears up space within the bedroom itself.